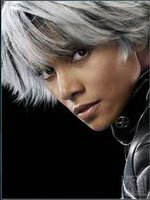 Halle Berry (Storm), right, takes her rightful place as the leader of the mutants. Her new hair style fits her beautiful face very well and the leather suit fits her gorgeous 40-year old body like a glove. Storm would be a great energy source because she can control the weather and produce lightning. She would also be a great cure for global warming and climate change. The special powers of the mutants are threatened by a cure for their so-called disease. It has great action, dramatic character interactions and a good plot. Jean Grey (Phoenix) didn't need to be killed by Wolverine; he could have just given her the cure. If the mutants are a metaphor for black people then what percentage of blacks would take a 'cure' that would turn them white? What percentage of whites would take a 'cure' to turn black? The mutants fight among themselves like blacks do now and like whites did in the first half of the 20th Century. Angel was clearly a native of San Francisco and we will not try to calculate whether Magneto's moving the Golden Gate Bridge to Alcatraz Island would really work.